It is the embodiment of the harmony of nature and life in China already for thousands of years.. The Chinese garden is a landscape garden style which ………….has evolved over three thousand years. It includes both the vast gardens of the Chinese emperors and members of the imperial family, built for pleasure and to impress, and the more intimate gardens created by scholars, poets, former government officials, soldiers and merchants, made for reflection and escape from the outside world. They create an idealized miniature landscape, which is meant to express the harmony that should exist between man and nature. 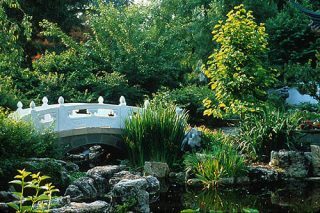 The Chinese garden at the RUB University in Bochum in Germany is an impressing example. The Chinese garden was designed by the famous Chinese architect Prof. Zhang Zhenshan (张振山)from 1986-1990. The Garden was donated by the Tongji University (上海同济大学) in Shanghai as a sign of friendship. It is named Qian Garden (潜园), reflecting the memory of poet Tao Qian (陶潛) who lived from 365 to 427 AD and laid out in the southern Chinese style. It covers an area of approximately 1.000 m² and half of its area is covered by a pond.